Can a Twitter chat with the late “Father of Europe”, Robert Schuman, engage more eurotweeps than a live chat with a European commissioner who isn’t dead? To celebrate his 129th birthday on 29 June, Mr. Schuman took over the @happeningo Twitter account in his first ever tweet chat. For 60 minutes he answered any question that wasn’t offensive or related to his self-imposed celibacy. Here are my live updates of the process, starting 30 days beforetime (June 2015). 30 DAYS: Find help to plan and promote your tweet chat. When you’re the Father of Europe and want to engage with your offspring in realtime, don’t leave it to chance with some social media ninja guru agency. 20 DAYS: Let the digital agency do its thing. 15 DAYS: Add the happening to a soonfeed. 12 DAYS: Let a couple of keen Brussels observers know what you’re planning. 7 DAYS: Post a time lapse house of cards video thingy on the day of an emergency EU summit. Because people are more likely to join in when other people start the conversation for them. And the more questions there are beforetime, the less room there is for trolls or negative sentiment to corrupt the hashtag feed. 3 DAYS: Practice condensing your wisdom into tweets of 100 characters or less. I’ve already taught Mr. Schuman how to do this. He’s still not sure what “the twitters” are, but that doesn’t matter at this point. 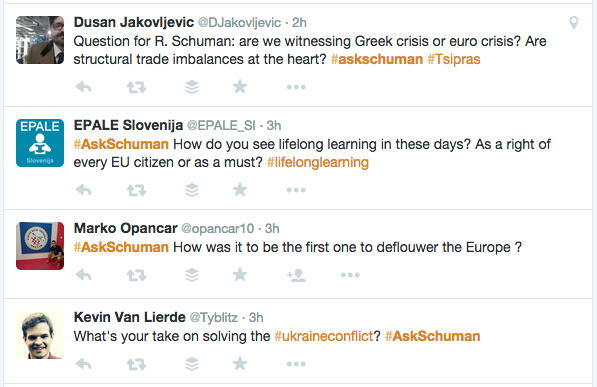 Dozens of questions have already been tweeted to #AskSchuman, so there are many answers to prepare. But Mr. Schuman is a deeply religious man. He shall not be working today. D-DAY: How did we do? Despite European Commission President Juncker hosting a big press conference at around the same time, we managed to engage 130 Twitter users and to reach over 120,000 users, which is pretty good in terms of vanity metrics. 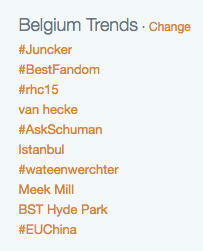 In fact the #AskSchuman hashtag trended in Belgium for most of the live chat. So it’s just as I suspected. 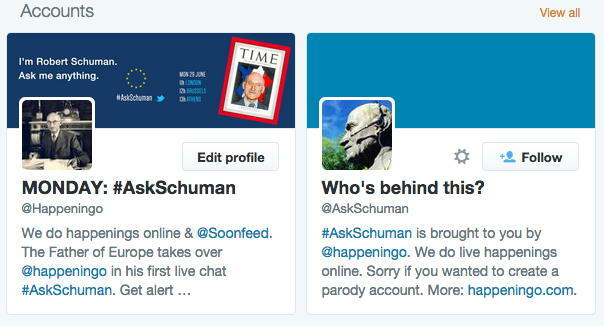 A tweet chat with Robert Schuman can engage more eurotweeps than a European commissioner who isn’t dead. Richard Medic is founder of happeningo communicators and Soonfeed Media.